I haven’t gotten to answer any questions over the past few weeks as I’ve had some special events such as spending time with Lisa Howell, the wonderful Australian dance physiotherapist who authored the Perfect Pointe Book and the Perfect Pointe System! Lisa and I then went off to the IADMS Conference (International Association for Dance Medicine and Science) where I got to meet – some of you! I so appreciate learning and being inspired by all the good work that is happening in dance medicine from around the world. Thanks to all who stopped to introduce themselves to me! My question concerns soreness around the sits bones during lunges and straddle split stretches (both the kind where you face a wall and push yourself closer and where you lie on your back perpendicular to the wall with your legs dropped open). I’m used to feeling sore there when working on hamstring flexibility, but never before with other stretches. It’s especially odd with the lunges, because the soreness is in the buttock of the BACK leg. Rotating the leg inward seems to help a little. Do you have any ideas what may be going on here? Your turnout muscles also attach in the area of the sits bone. You gave a good clue that rotating the leg inward helps relieve the soreness some. Why don’t you try putting a pinkie ball or a tennis ball underneath your pelvis and rolling lightly around. Pay special attention to the sitting bone area. 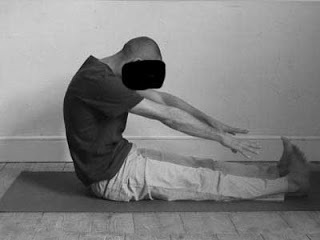 After gently massaging that area do your stretching and see if there is any difference in your response. Let me know if that helps! If the hamstrings are tight where might a dancer feel discomfort? We talked about this in class this morning. It seems logical that if the hamstrings are tight you would feel that tightness at one of the ends of the muscle. Either around the sits bone like the above question – or at the knee. But interestingly, often hamstring tightness and problems show up as lower back aches, and lower back problems will be felt in the hamstrings. Think about a dancer who has tight hamstrings and is sitting on the floor with one or both of the legs in front of them. As you can see from this picture, the hamstrings aren’t being targeted very effectively – rather the back is taking the brunt of the stretch. Try using the pinkie ball on your back and pelvis. I really should buy stock in a pinkie ball company! – just teasing! Sometimes releasing muscular tension above or below the hamstrings will help. I have students spend about a minute rolling a pinkie ball underneath one foot. They are massaging the plantar fascia of the foot. Then they go to touch their hands towards the floor and generally at least 50% of them will feel the hamstring loosened up on the side they used the pinkie ball. They didn’t stretch the hamstring directly – and it still benefited! I promise I’ll get back on track with the newsletter. I’m working on updating the website and along with that bringing some new information to you! Stay tune for more info in future newsletters!